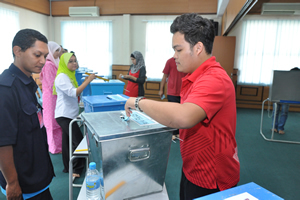 BANGI, 26 Sept 2012 – The National University of Malaysia (UKM) campus election went on smoothly without any untoward incidents thanks to its Security Department which was able to control the situation well. 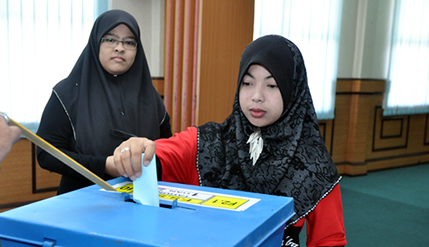 There were some tense moments when some students decide to parade and campaign at the candidate registration centre on nomination day and on the eve of the polling day when there were some aggressive campaigning. But thanks to the diplomatic and friendly approach used by the Director of UKM Security Department, Lt Kol (B) Jury Tasripan the situation was kept well under control. He was happy with the cooperation of the students who abided by the rules and cooperated with the security personnel whenever they were cautioned for being very boisterous. Peace and security in the campus was one of the issues brought up during the campaigning apart from complaints over water supply disruptions, student accommodations and problems over internet connections. There were some mudslinging and provocations during the campaigns but overall supporters from both sides were pretty much well behaved. 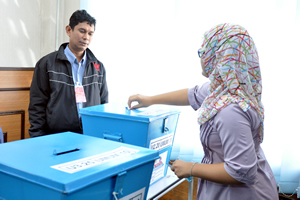 A total of 19 seats were contested for the faculties and nine general seats. The results were announced by the Deputy Vice Chancellor (Students and Alumni Affairs), Prof Ir Dr Othman A. Karim at 11.30pm.